The artist printing on a tobacco leaf. Images courtesy of the artist and the Aldrich Museum. A tiger skin fabricated from an arrangement of filter cigarettes. A detail of the tiger skin rug. Chairman Mao’s slogans printed onto cigarettes. 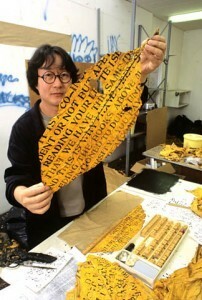 In 1995 Xu Bing was invited to visit Duke University in Durham, North Carolina (1). Exploring the area around Durham, he visited the Duke Homestead and Tobacco Museum, tobacco farms, and the former Liggett & Meyers cigarette factory, experiences that planted the seeds for a body of work that now spans more than a decade. It might come as a surprise that one of China’s most significant contemporary artists chose to focus his attention on tobacco, but given the trajectory of the artist’s career—particularly his interest in history, material culture, language, and the systems of meaning set up by society—it seems preordained that he would eventually gravitate to the subject. Bluish tendrils born from the subtle smoke. And leaves my mouth feeling like a divine furnace (3). Xu Bing’s interest in language has manifested itself in a body of work that is strongly conceptual in nature, and Tobacco Project’s use of research, archival materials, and text points to the artist’s idea-driven methodology. But, as with Xu Bing’s other endeavors, Tobacco Project tempers its conceptual approach with the stunning use of materiality. The Museum’s galleries are not only filled with a range of objects made from the world of tobacco culture, but also the strong and immediately identifiable aroma of cured tobacco products. Xu Bing’s personal circumstances are crucial to helping us to understand the artist’s influences in the creation of Tobacco Project. During China’s Cultural Revolution (4), when he was nineteen years old, he was relocated (as were many Chinese people) to a rural agricultural area. Spending nearly three years working in a farming community left him with an understanding and respect for farming as a way of life. This connection with the land and the people who farm it was reawakened during his visits to the tobacco farms of North Carolina and Virginia. But it was another personal connection that loomed larger over the subject of tobacco: in 1989, at the age of sixty-four, his father had died of lung cancer after a lifetime of smoking (5). Included in the exhibition are several works that allude to this fact, including Calendar Book, an assemblage that combines a plastic desk calendar with printed cigarette boxes, a double cigarette, and copies of the artist’s father’s medical records. On entering the museum we are confronted with two works that speak of the transmission of tobacco culture from the New World to China. 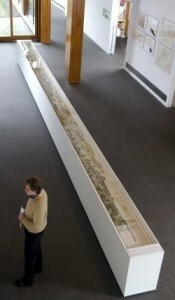 Traveling Down the River consists of a reproduction of the renowned 42-foot-long scroll painting, Along the River during the Quingming Festival, by the artist Zhang Zeduan (1058–1145). Created before the introduction of tobacco to China, it pictures a panorama of human activity along the Bian River in Henan Province. Overlaid down its length is a 42-foot-long cigarette that is lighted periodically during the duration of the exhibition (right & below), leaving a trail of ash (and burnt scroll) that marks the fire’s progress (6). The rivers of China are the transportation arteries that brought Western influences, including tobacco, into China from abroad. It is believed that the Portuguese first brought tobacco to southern China as early as the 1540s, with the smoking habit enveloping most of the country by the middle of the seventeenth century. While Traveling Down the River can be read as a visually poetic response to tobacco’s spread (and its destructive impact on human well-being), the adjacent work Prophecy is a pointedly ironic chronicle that records the trade in tobacco products between the United States and China over the course of almost a century. Beginning with a copy of a British American Tobacco Company (BAT) stock certificate and marketing agreement with a Chinese firm, it includes documents showing BAT’s subsequent profits in China, copies of correspondence regarding the donation of BAT’s assets to Duke University by its owners, a check and related documents from Duke University to Xu Bing for the creation of Tobacco Project, and finally a copy of a check from an American collector who acquired a work from Tobacco Project. The linkage between the American and Chinese economies is not just a recent phenomenon, and Prophecy documents a circular connection across both time and space. 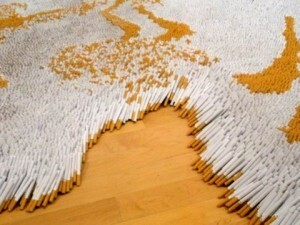 The dramatic centerpiece of Tobacco Project is the work 1st Class, a carpet-like sculpture resembling a tiger-skin rug that has been made of over a quarter of a million cigarettes. The piece’s title refers to the brand of cigarette used in its fabrication: 1st Class, an American discount brand that is primarily marketed through convenience stores. In China, tiger skins have traditionally been status symbols, and the demand for the pelts along with a rapidly shrinking natural tiger population has led to the recent phenomenon of “tiger farms,” where tigers are raised for both skin and bone (tiger bones are used in traditional Chinese medicine) (7). 1st Class is an object of undeniable beauty, yet it is made of the most common vehicle of nicotine addiction. By reveling in contradiction the work eloquently speaks of the allure, glamor, and status that humans connect with both consumer goods and risky behavior. What is more glamorous: James Dean with a cigarette hanging from the corner of his mouth, or a tiger skin rug underfoot? In 2007 the artist made his first trip to Richmond to discuss the possibility of expanding Tobacco Project into an exhibition at the Virginia Museum of Fine Arts. The area around Richmond was also a major center of tobacco production, and this visit, along with subsequent ones over the course of the next three years, led to both the recreation and/or reconfiguring of earlier tobacco-based works and creation of new ones for this exhibition. For example, 1st Class is the recreation of Honor and Splendor, a similar work that was made for an exhibition of works from the Tobacco Project in China at the Shanghai Gallery of Art in 2004. Many of the new and/or reconfigured works in the Virginia Museum of Fine Arts Exhibition, including 1st Class, were made in Richmond with the help of students from Virginia Commonwealth University. One of the new works that resulted from Xu Bing’s time in Richmond was Backbone, a book project created in collaboration with his friend René Balcer. Visiting the archives of the Valentine Richmond History Center, a museum dedicated to the history of the greater Richmond area, Xu Bing became fascinated with a collection of historical stencils that were used to print tobacco brand names on boxes and crates. The romantic and suggestive nature of the brand names—DEW DROP, OH MY, VIRTUE, BLACK SATIN, QUEEN OF THE EAST, etc.—led Xu Bing and Balcer to conceive of work that would be a poem dedicated to the African-American women who worked tirelessly in the tobacco processing industry. Xu Bing’s interest in language, coupled with Balcer’s background as a writer (he has been a writer and producer for television’s Law & Order, in addition to other television and film projects) proved to be a fruitful combination, leading to the creation of a piece of concrete poetry that has the rhythm and cadence of a traditional blues song. Indeed, this resemblance led to Balcer recruiting Captain Luke Theyer and Big Ron Hunter, blues musicians from Winston-Salem, North Carolina, to record a song using the words from the piece (8). Xu Bing’s and Balcer’s unusual interrogation of history and material culture led to the creation of these genre-bending works that profoundly reveal underlying truths about the history of tobacco production in the American South. Above: Reel Book, 2000; modified in 2011, Continuous roll of cigarette paper, typed with text from With the Poets in Smokeland (1875–90), wooden crank mecha­nism, printers ink, 16 1/2 x 29 x 10 1/4″. Typing by Andrea Donnelly; crank mechanism fabricated by Brad Johnson, Harvey Craig, and Alan Dippy, courtesy of the Duke University Museum of Art; rubber stamp by Jill Zevenbergen. Many of the small works included in Tobacco Project are made of tobacco and cigarette ephemera. They juxtapose found language with found objects to uncover hidden truths embedded both in tobacco products and the cultures that created them. 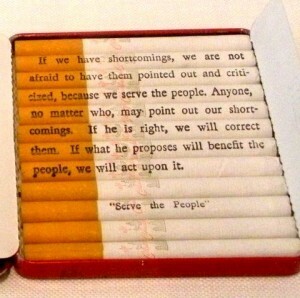 An example of this is the work Redbook, which combines a metal box of Chinese Zhonghua cigarettes with text from the book Quotations by Chairman Mao (see detail, left, below) (9). Zhonghua is a Chinese luxury brand, traditionally favored by the ruling elite, and recently adopted as a status brand by the rising class of Chinese entrepreneurs. A Chinese Web site that sells Zhonghuas advertises the brand by stating: “This is the preferred cigarette for factory bosses all around the southern coast belt of China. Bosses lose face if they smoke anything else.” (10) Carefully rubber stamped on the twelve cigarettes in the box is the following quote from Chairman Mao: “Classes struggle, some classes triumph, others are eliminated. Such is history, such is the history of civilization for thousands of years. To interpret history from this viewpoint is historical materialism; standing in opposition to this viewpoint is historical idealism.” In this simple work, Xu Bing has managed to summarize the sweeping changes that have swept over China in the last several decades. To contemporary factory bosses, Chairman Mao represents the past, yet they can’t escape class struggle as they participate in China’s role in the exploding global economy. 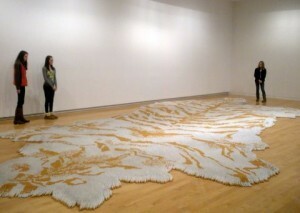 The Virginia Museum of Fine Arts originated Xu Bing’s Tobacco Project, after which it traveled to the Aldrich Contemporary Art Museum. Interestingly, Connecticut shares with Virginia a history of tobacco production, with the Connecticut River valley being the only region in the United States that produces premium cigar wrapper tobacco. As a fifteen year old in 1944, Martin Luther King, Jr., made his first trip outside the then-segregated south to pick tobacco for a summer in Simsbury, Connecticut. King came north with fellow Morehouse College students to earn money to pay for school, living in a dormitory built at the edge of a tobacco field (12). Special thanks go to John B. Ravenal, the Sydney and Frances Lewis Curator of Modern and Contemporary Art at the VMFA, who was responsible for the complex task of organizing the exhibition; Xu Bing’s assistants in the United States, Jesse Robert Coffino and Yao Xin, for their help with installation at The Aldrich; Kelly Burrow, assistant registrar at the VMFA, and Mary Kenealy, The Aldrich’s registrar, for their logistical support; and Michael Muelhaupt, a former student of Virginia Commonwealth University, for supervising the installation of 1st Class. Both the VMFA and The Aldrich are particularly grateful to Caroline Hsu-Balcer and René Balcer for their support of the exhibition. Special appreciation goes to The New York Botanical Garden for growing the living tobacco included in the exhibition at The Aldrich (in blossom, left) , and, for providing the artist with materials, to Marvin Coghill, and to Phil James of Mundet International. Of course, Tobacco Project is ultimately the result of the dedication and insight of the artist. We are grateful to Xu Bing for an extraordinary experience that transcends both Chinese and American culture to become truly universal. 1. Duke University was founded by Washington Duke (1820–1905), a cotton farmer who turned to growing tobacco in 1859. His sons subsequently founded the American Tobacco Company, helping make North Carolina the heart of an international tobacco empire. 3. Quoted from Charles C. Mann’s book 1493: Uncovering the New World Columbus Created (New York, NY: Alfred A Knopf, 2011), p. 165. 4. The Cultural Revolution was an often violent socio-political movement that occurred between 1966 and 1976. Set into motion by Mao Tse-tung, its goal was to enforce socialism by purging both capitalist and traditional cultural elements from Chinese society. 5. Details of Xu Bing’s life were gleaned from both conversations with the artist and John Ravenal’s essay “Tobacco as a Universal Language,” included in Xu Bing: Tobacco Project, Duke/Shanghai/Virginia 1999–2011, the book published by the Virginia Museum of Fine Arts in 2011 in conjunction with the exhibition at the VMFA. 6. The Quingming Festival is an annual springtime celebration where people remember and honor their ancestors at gravesites. One component of the festival that deepens the possible meanings of Traveling Down the River is the burning of “spirit money” and paper replicas of material goods, such as cars, homes, and most recently, mobile phones. In traditional Chinese culture it is believed that people still need these things in the afterlife. 8. BackBone: lyrics by René Balcer; music by Captain Luke Theyer, Big Ron Hunter, and Michael Sackler-Berner; musicians: Captain Luke (vocals) and Big Ron (guitar). 9. Commonly known in the West as “The Little Red Book,” Quotations from Chairman Mao is a book of selected statements taken from the speeches and writings of Mao Tse-tung, former leader of the Chinese Communist Party. It was published and distributed from 1964 through 1976. 10. TigerPipes.com, a company specializing in the sales of Chinese tobacco products. 11. Xu Bing, “Tobacco Projects 1, 2, 3,” in Xu Bing: Tobacco Project, Duke/Shanghai/Virginia, 1999–2011, p. 67. 12. Steve Hartman, Martin Luther King Jr. Shaped by Connecticut Town, CBS Evening News, January 17, 2011.